Im going to be accentuating the natural roundness of the female body on the new ceramic works which will also be "seated" on very round pots. 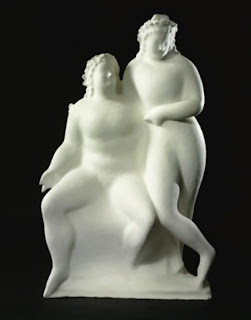 Elie Nadelman was an artist active during the early 1900's who created many different types of figurative sculpture, but the ones that recently caught my eye are those which appear to emerge out of the material from which they are sculpted. 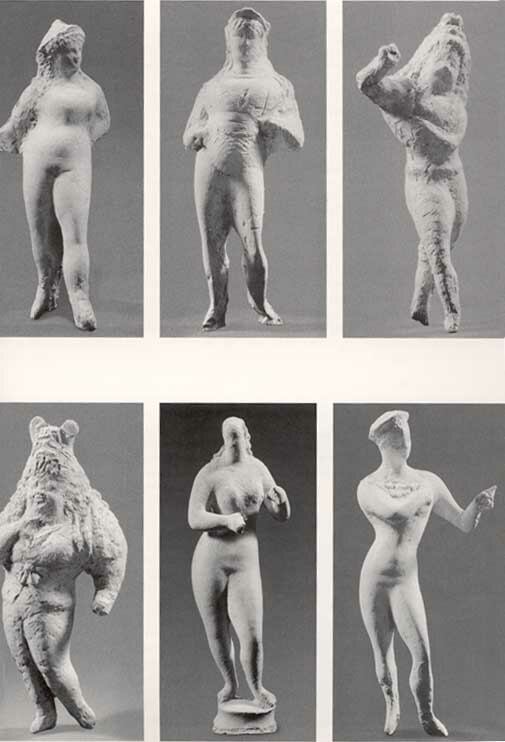 I am currently looking at merging the figure and plant sculpted elements to the ceramic vessel and I think these type of figures would work since if I made something similar they would literally be a part of the vessel they were on. 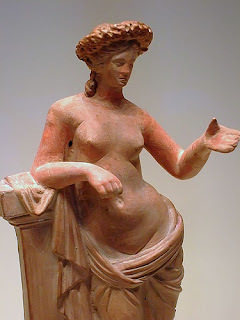 Below (presumably inspiration for Nadelman's figures) a Tanagra figurine, which as usual has a gentle swaying movement about them, something simple that I like to impart on my miniature maidens when placing them on pottery. 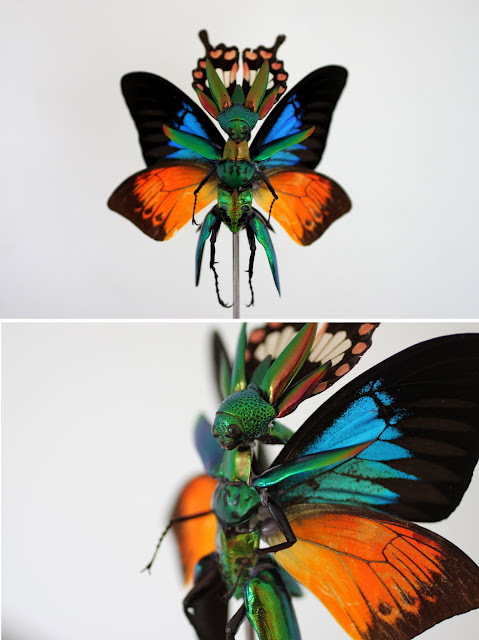 Have you heard of Cedric Laquieze, I first saw him on who killed bambi and they were calling his skeleton-floral sculptures creepy, but upon scrolling around on his blog, he also makes fairies, with real butterfly wings. But not like mine, they are like little armored bug folk, I really like them, check out his BLOG and see if you like it, I thought everything had a finesse and very polished look to it. I met with Sylvia Netzer yesterday, we discussed Bernard Palissy again, and this is only because of the connection i made with encrusted ocean life onto man made objects as being a sort of inspiration for my encursted pots. After taking a look at his work (and the last photo, work of a contemprary artists working in his style), I can definitely see the similaries to my own encrusted works. I have been looking at Greenwich House Pottery, I have known about it since attending City College, but at that time I had opted to go to the 92nd street Y to study porcelain with Bobby Silverman, now I want to get back to wheel throwing so I can make my encursted pots. It is $565 a class and the Spring term is from April first until June 25th. It looks like my choice of instructors would be either David Gibson or Kathy Erteman of which I suppose I should research both online before deciding. I might even stop by one day before/after work to see whats going on or to register in person. 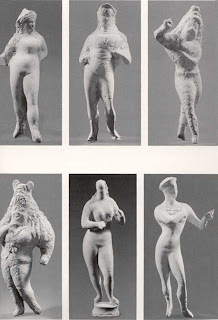 I NEED clay in my life, this modeling crap just isnt cutting it. :-p I only call him Icarus because he is too young to be called Daedalus, no honestly I guess like the plant-daphnies I have no choice but to call them Icari or Daedali since that is the first thing that comes to mind since they are not angels but winged men (and women). Anyhoot, here is the latest and loveliest, made here and with lots of love, I tell you wings please my inner being and make me really happy to behold so enjoy! below she was a standing figure, arms stretched upward. I then decided to put her arms down, she is to be a seated siren. There she was with the figure from last time. Now I have created excitement by adding the feathers to her arms. I have always enjoyed winged figures, expect to see more of the same. Yes I know they originated in NY, but I have been back for about a month and this is the first one to emerge.